Known for its diverse population, high-rise architecture and multicultural mix of food, Vancouver is also a place where nature's never far away. Fog hangs low over the mountain and a mid-autumn chill nips at our faces as we board the aerial tramway for the ride up Grouse Mountain. Thirty minutes from downtown Vancouver, Grouse gives locals the chance to ski after work during the winter months, when the slopes stay open until 10pm. At other times of the year, there’s hiking, including the Grouse Grind, a 2.9km trail rising more than 850m via 2830 stairs. Considered one of the world’s most dangerous hikes for its tendency to attract the physically unprepared, it’s notorious for its difficulty and for the unwitting tourists who attempt it in thongs and even high heels. Since 2011, at least eight people have reportedly died on the trail. In some ways Grouse is emblematic of the city, of its proximity to nature and its ready attitude to adventure. Then there’s the view. The renowned local writer and artist Douglas Coupland has described his home town as “a city of scenery” and, on a clear day, the panoramic outlook from Grouse over Vancouver is supposed to be spectacular. He roars with laughter and repeats it a few times, perhaps in wonder, perhaps because the line doesn’t quite get the laughs he might have expected. Still, it is extraordinary: as we look down on where Canada’s third largest city should lie, we see only white, the deep-green of the forest poking through. Not for the first time during my stay in Vancouver, nature feels very close indeed. To a West Australian, British Columbia’s biggest city feels in some ways very familiar. A city of roughly two million with a lingering frontier mentality, perched on the west coast of a vast country and populated by a diverse, outdoorsy people. There’s even a more-than-decent wine region a few hours down the road (in this case, the Okanagan Valley). In other ways, it seems strikingly exotic: its landscapes, vegetation, wildlife and notably rainy weather, for starters. All but the latter are on show when we reach the top of the tramway, where there are zip-lines, paragliding, walking trails, a chairlift to the summit, a cosy restaurant and the deeply silly but undeniably entertaining World-Famous Lumberjack Show (self-proclaimed). Then there’s the mountain’s star attraction: Grinder and Cooler, the two grizzly bears that live in its wildlife refuge. Rescued separately as orphans in 2001, the bears seem to have achieved the status of minor celebrities, with their annual emergence from hibernation widely reported in local media. 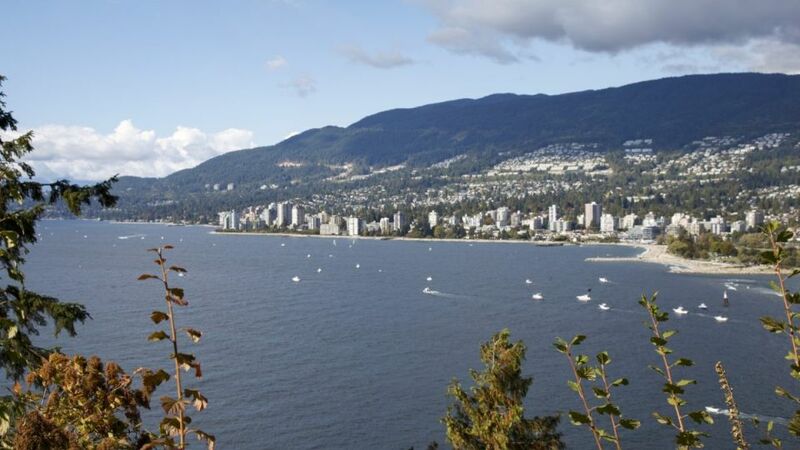 It would be easy to focus only on Vancouver’s natural attractions, among them the historic Capilano Suspension Bridge Park, with its treetop boardwalks and canyon views, and the superlative Stanley Park. The latter is a little like our Kings Park, its 400ha of temperate rainforest threaded with walking trails, edged by the spectacular seawall path, justifiably a Vancouver institution. But there’s also a more urban picture of a city known for its friendliness to cyclists, success on worldwide liveability rankings and proliferation of tech start-ups (Flickr and active-wear brand Lululemon are among the better-known local businesses). It’s a place dubbed Hollywood North for its status as the third-largest centre of film production in North America, where real estate is so painfully expensive it’s a local obsession, and where the population is sufficiently diverse for the city to be considered the most Asian outside of Asia and the most American outside the US. Tourists pose in Canada Place with a piece celebrating Canada's 150th anniversary of Confederation. High rises in downtown Vancouver. A seaplane takes off in front of Stanley Park. A ferry crosses to Vancouver's north shore. A sunny day in Stanley Park. The Lions Gate Bridge, a local landmark. Traffic across the Lions Gate Bridge. Canada Place is a busy cruise ship terminal. A cruise ship departing Vancouver in the late afternoon. A stroll down along Denman Street in the west end is a good illustration of this multi-ethnic make-up, taking me past restaurants serving Japanese, Italian, East African, Korean, Turkish, Chinese, Malaysian, Spanish, Mexican, Vietnamese, Persian and Ukrainian cuisine. There’s even an Australian pie shop, an American barbecue place and a branch of the Canadian coffee chain Tim Hortons thrown into the mix. Honestly, I don’t remember when I’ve seen so many restaurants in a city. Still, nature never feels far away. This is the case whether you’re sitting in the shaded squares of Granville Island, known for its very popular food market, or walking under the street trees of the historic Gastown neighbourhood, with its enthusiastically patronised souvenir shops and numerous boutiques and restaurants. It’s even the case when visiting institutions such as the Museum of Vancouver, surrounded by the waterfront Vanier Park in the beach suburb of Kitsilano and worth a visit for its spaceship-like architecture, locally iconic oversized crab sculpture and permanent exhibitions covering topics such as the surprisingly interesting history of Vancouver’s neon lights and the city’s 1960s counterculture. It’s a similar story at the downtown hub of Canada Place, amid the greenish-blue skyscrapers — the majority of them residential — that give Vancouver the nickname the City of Glass. Here, surrounded by the bustle of busy streets, office workers and hotel lobbies, you’ll find views over the water to the green of Stanley Park, the north shore and beyond, along with buildings such as the Convention Centre West, completed in 2009 and renowned as one of Canada’s most eco-friendly buildings. Its 2.5ha “living roof” is planted with more than 400,000 indigenous plants and grasses, alongside four beehives tended by a beekeeper who doubles as a political columnist for a local newspaper. Canada Place is a busy cruise ship terminal, and home to a large sculpture of a killer whale by none other than Coupland — and where I finally get my view over his city of scenery. Throughout the day, seaplanes buzz along the waterfront, headed out on scenic flights or on scheduled routes to towns up the coast or on nearby Vancouver Island. Later that afternoon, I’m on board one, the fog having cleared sufficiently for our six-seater Harbour Air Beaver, which dates from the mid 20th century, to take off. Taking off on the seaplane flight. Ships in the Strait of Georgia. Homes in Vancouver's northern suburbs. A ship in the Strait of Georgia. High rises and a freeway from above. Vancouver, with the BC Place stadium. Railway tracks and carriages from the air. Stanley Park and the Lions Gate Bridge. It’s my first time in a seaplane, and it’s magnificent: the thicket of downtown high-rise buildings flanked by the cruise ships at Canada Place, forest of Stanley Park and suburbs stretching to the horizon and US border beyond. There are landmarks — the distinctive Lions Gate Bridge and BC Place stadium among them — but also small islands dotted with homes, palatial waterfront properties with swimming pools and private docks, and the silvery-grey waters of Vancouver Harbour and the Strait of Georgia, studded with ships. Then as we circle over the city, patterns reveal themselves in the grids of buildings and streets, in the sinuous highway ramps, in the yacht marinas and housing developments, the carparks and multicoloured train carriages on the railway tracks. All up, we’re in the air for about 20 minutes. But by the time we come back around for a smooth landing, it’s made an impression that feels far more enduring. For more on visiting Vancouver, go to tourismvancouver.com.